In preparing for the upcoming Appalachian Women’s Retreat, I found it quite challenging to think about the ways in which I might relate to Saint Hildegard of Bingen, our spiritual guide for the retreat. 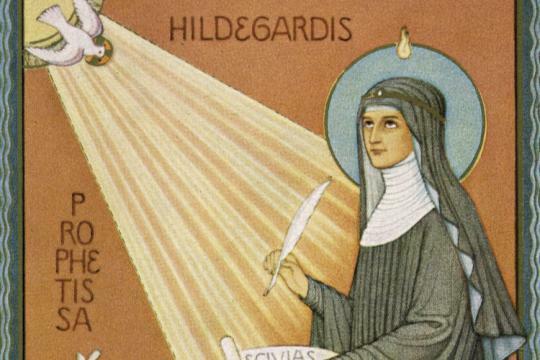 Hildegard was a German Benedictine abbess who lived from 1098-1179 A.D. By all accounts, she was a truly amazing woman—a polymath—who used her incredible talents as a composer, healer, philosopher, visionary, leader, and naturalist. Having been offered up by her parents, Hildegard survived much of her childhood and young adulthood trapped in a small room with, Jutta, an “anchoress” to God. The two were enclosed in what was basically a cell (even the doorway was walled in with stone) inside of the Benedictine monastery at Disibondenberg. Upon Jutta’s death, the abbot released Hildegard from the cell. Years later, she went on to lead a group of nuns in forming a new monastery in a different location (Rupertsberg)—something a woman had never done before. The more I learned, the more I kept thinking: How am I like Hildegard? How can I connect with her? I’m quite happy with who I am, but don’t have any illusions of becoming a remarkable historical figure. I live a relatively ordinary life in a different time and place. I never suffered anything so horrible as being “walled in” for 20+ years. I’m married, have a child, and rarely attend church (I certainly never considered becoming a nun). Occasionally, I write short blog posts, but not full-length books about medicine, botany, and theology. Could these possibly be the words of a nun who lived 900 years ago? They seemed so relevant that I wished they were the words of a yet-to-be discovered visionary leader of today. In sitting with these words—in considering their timelessness, wisdom, and power—I found myself understanding how I relate to Hildegard. I am not like her, but I need someone like her in my life. She will be my teacher, my mentor, and my source of inspiration. I don’t need to aspire to her greatness, but she will give me strength when I feel trapped or lost, when I’m sick, when I’m up against sexism or injustice, and when I struggle to find ways to make the world a better place. If Hildegard’s words speak to you, please join us for the retreat (April 26-28) in the beautiful Appalachian Mountains of Western North Carolina. Space is limited, so reserve your spot soon (click here for more information)! P.S. If you’d like to read a gripping historical novel about Saint Hildegard of Bingen, check out “Illuminations: A Novel of Hildegard von Bingen” by Mary Sharratt.